At first glance, I was both intrigued and wary of the note combinations in the Trish McEvoy Orange Ginger Scented Candle. How could these two intensely tangy scents combine in a way that wouldn’t be disastrous and horrifying? Luckily, I was pleasantly surprised by the aroma wafting out of the 3 oz. jar. The vibrant scent lent just a hint of spicy deliciousness to my living room as I watched TV the other night. Truth be told, I want to savor every single moment of this candle -- because it’s one of the more unique in my collection! 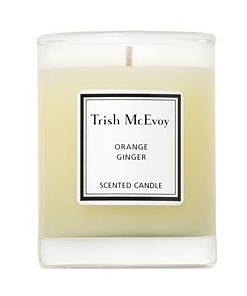 The Trish McEvoy Orange Ginger Scented Candle is $17.50 and has a burn time of 18 hours.